Managing late blight is an ongoing challenge, but knowing which strain one is faced with controlling can go a long way in minimizing the frustration. There may not be many tools in the fungicide toolbox, but those that are there can be used more effectively if it is undearstood which strain is in the field. Unfortunately, just as growers reach that knowledge a new strain is identified. In 2010, a US-22 strain was identified in Michigan; thankfully, it did not reach Canada. However, it could, and then what will growers be left to do? Until 2009, there was no clear national strategy on dealing with late blight, and information collected by one provincial agricultural department was not always shared with other provinces in a timely manner. It was also unknown if all Canadian potato-growing areas were dealing with the same strain. Reports would be filed that products were ineffective in one area, but worked in another, and it was unknown if this was due to product failure or incorrect application or if, in fact, the strain of late blight in that area was resistant to the fungicide. If there is an upside to having US-22 enter Canada, it could be that there are some effective options for control. Banks says two other strains of late blight, US-23 and US-24, have been identified, with the latter prevalent in North Dakota, which could have an effect on the Manitoba crop. “It is important for growers to find out what strain is infecting their fields,” continues Banks. A website is also planned that will keep current on the latest findings regarding late blight and it will include contact information for each province to give growers access to the late blight experts in their area. In addition, a YouTube video (http://www.youtube.com/watch?v=q1Xa4bJ_YnI) on Al-Mughrabi’s late blight management initiatives was started in Alberta to give growers more information about late blight. “The preliminary results at the end of 2009 showed that Manitoba has US-11 and US-6 while US-8 is most common in Quebec, New Brunswick and Prince Edward Island,” Al-Mughrabi reports. Al-Mughrabi’s initiative to develop a national network of late blight experts who share information and then deliver it to growers may prove to be what is needed to keep late blight in check consistently. With ready access to the latest information and knowledge of what strains are prevalent in each area, growers will not have to worry needlessly every time a new strain is reported south of the border. Instead, they will know which strains they are likely to face if conditions are right for late blight infections and they will know which products will effectively control that strain. They will also have all the information available to continue resistance development minimization. 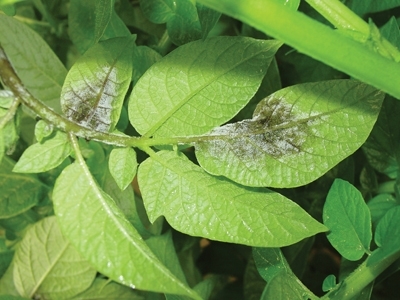 With the 2011 growing season quickly approaching, growers can be confident that rumours of new strains of late blight entering Canada are already being researched by members of the National Potato Late Blight Working Group. And those members will, no doubt, have the strains identified in each region and control strategies to recommend before any of the late blight pathogens can become a yield-robbing problem. With some late blight strains developing resistance to available products, and few new products being introduced, the announcement that phosphoric acid products to control late blight are now available is great news. Some growers have been using unregistered formulations of phosphoric acid and researchers have been working to determine how to use it most effectively. But now, a registered formulation for use in potatoes is being marketed in Canada under the name Confine. It is manufactured by Winfield Solutions of St. Paul, Minnesota, and marketed in Canada by the AgroMart Group, near Thorndale, Ontario. Foliar applications at higher rates provided excellent control of late blight and pink rot tuber disease, providing application was made prior to pathogen inoculation. Control was most effective when the product was applied five times. Further research is being conducted to determine the effectiveness of Confine when used as a tank mix for resistance management. Application can be made as a “root drench,” which would be an effective disease management tool. Three applications via chemigation could provide good control. Control of pink-rot post-harvest is effective if treatment is done before infection, preferably within six hours of harvest. It is not to be used on seed potatoes because it can hinder sprouting. More work using phosphoric acid is planned, but the initial results in New Brunswick and Prince Edward Island look very promising.